When I was gearing up to tackle Eduard’s Bf 109E-7 Trop, I figured I’d probably want to chase it with something sporting a dead-simple paint scheme. Between the Lavochkin La-5, Yakovlev Yak-3, P-47D Thunderbolt, and the Messerschmitt, well, that’s four camo jobs in a row. I need some modeling sorbet to cleanse the palate. The Mosquito NF Mk.II is just such a frozen treat. The Mosquito is a triumph of the idiom “you can’t keep a good idea down”. When De Havilland showed their design for a wooden-construction, twin-engine aircraft to the Ministry of Defense, they were told to piss off. They built it anyway, at their own expense, and when the twin Rolls-Royce Merlin-equipped prototype blew past the vaunted Spitfire’s top speed, orders started pouring in. Thus the Mosquito, one of Britain’s most versatile aircraft of the war. Name a role, and it probably served in that capacity. Over the course of World War II, it operated as a heavy fighter, light bomber, ship raider, photo-recon plane and, equipped with radar, as a night fighter. In such a role, its four .303 Browning machine guns and four 20mm cannons gave it a devastating punch. I’d originally intended to bust out a highly detailed Aires cockpit set for this build, but I’ve decided to save that for another Mosquito that I intend to build as a Malta-based Night Intruder (similar to the night fighter, but dispatched against enemy airfields) at some point in the future. Thus, this one will be built stock, save for the decals. Stay tuned for built reports! If that synopsis of the Mosquito was your own verbage,It’s glorious !!! It’s always been one of my aviation wonders [ as I said about my similar thoughts on the Mark IV Panzer ].The thing just flew,literally & figuratively.I understand wanting the break f/ another campo scheme [ after stripping a K.T. due to a paint colr err ] & having to redo,I’m ready for mono-tone.But how bout just a plain green one ? Don’t you think black will absorbe every favet of it’s looks ? Just a thought from a rank amateur. keith r.
Well, with the nightfighters it was either black or grey/green up top and black on the bottom. The Night Intruder I’m planning actually has the latter, but this one’s going to be black. As for absorbidng its looks, stay tuned. I’m not going to be painting it straight black, exactly. 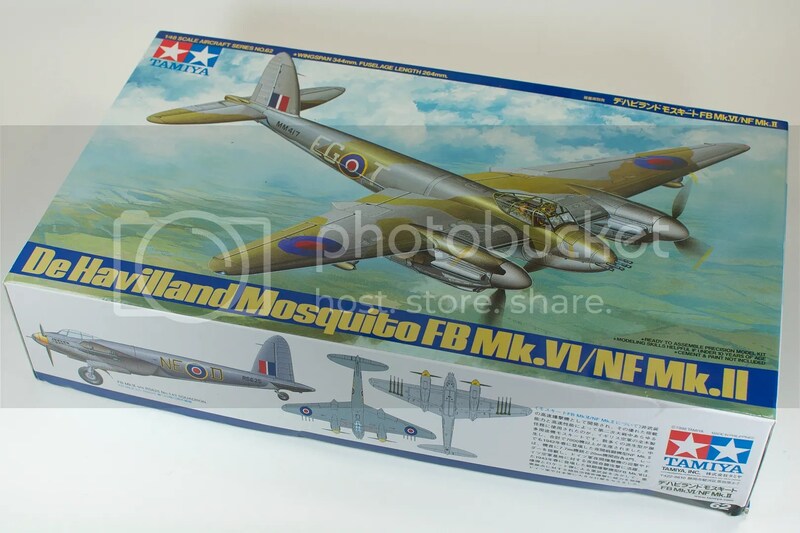 If the 1/48th Mosquito offering is HALF as good as the 1/72, you’re gonna have a blast. I’m currently doing the 1/72 for the FSM Night Fighters GB and I’m trying to figure out the best way to break up the monotonous all black paint scheme. Ugh.